Truman discusses working with his father on the next chapter of ‘Scout,’ which you can help bring to life on Kickstarter. Ben Truman is a writer and game designer, but comics fans might know him best for co-writing A Man Named Hawken with his father, the great Timothy Truman. 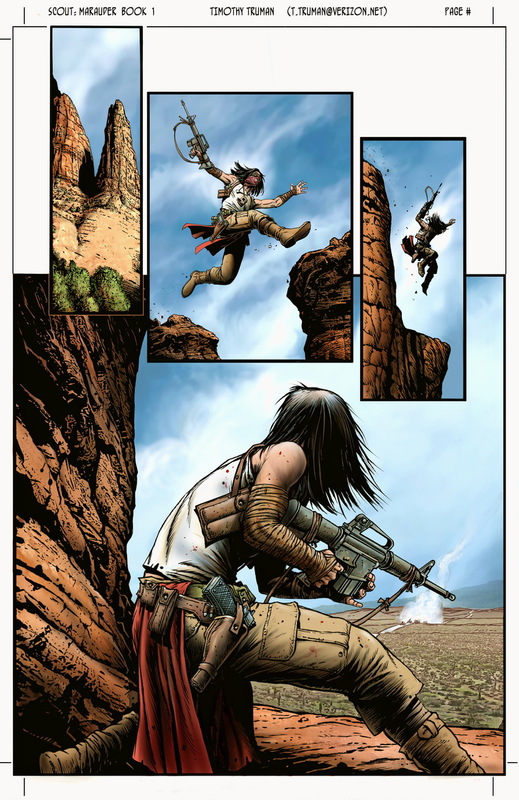 He’s written or co-written other comics over the years for Creepy, Conan, FUBAR and elsewhere, but he and his father have just launched a Kickstarter for their biggest project to date, Scout: Marauder. 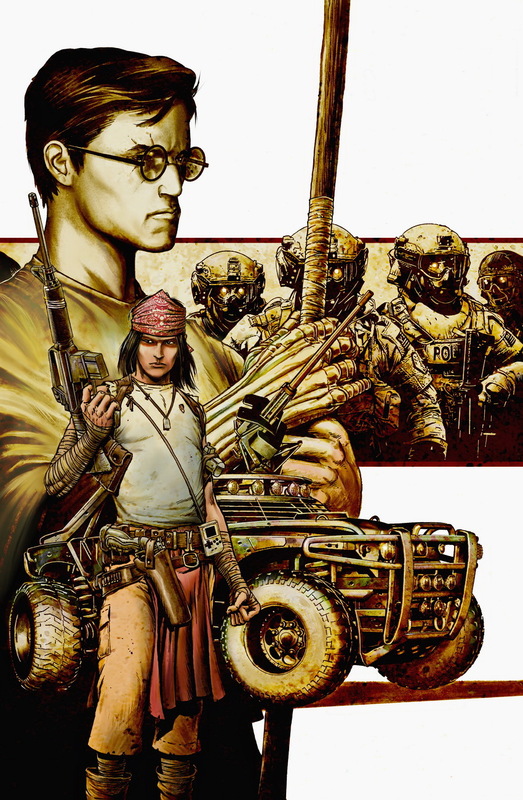 For people who don’t know, Scout and its sequel Scout: War Shaman were two books written and drawn by Tim Truman in the 1980s and early 90s about Emmanuel Santana, an Apache ex-Army Ranger in a collapsed United States in the distant future of 1999. At the end of the series, Scout was killed leaving his two sons behind. The new book opens years later, the two boys having been separated since. At a time when the idea of an environmentally ravaged United States that collapsed due to infighting no longer seems insane or absurd, it is perhaps a good time for Scout to return. The Kickstarter recently launched and Ben Truman answered a few questions about the book and working with his father on it. 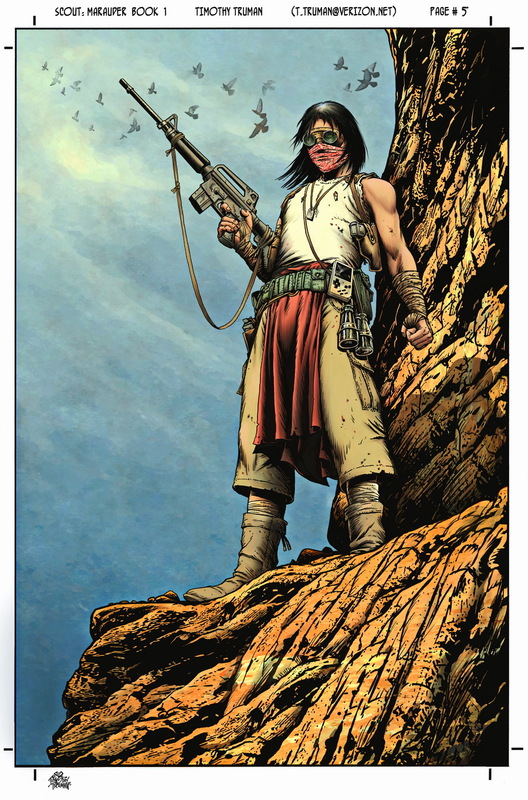 Scout: Marauder is the continuation of Scout, a comic my Dad created in the 80’s. It follows the story of Scout’s children, Victorio and Tahzey, as they are reunited in a post-apocalyptic, dystopian future. How did you first start working with your dad? I would consider our first professional project a Conan the Barbarian webcomic made for Dark Horse back in the Myspace days, but we’ve been collaborating for as long as I can remember. He involved me in his work from an early age. He would use pictures of me as drawing reference, he would ask me for help on his stories, and let me design costumes for his characters. He even shared some royalty checks with me when I was young. 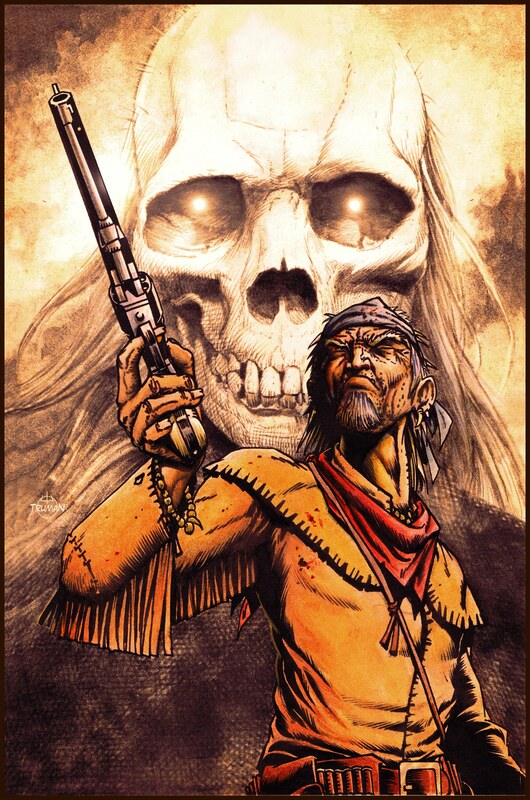 Our biggest project together was A Man Named Hawken, a supernatural western comic that we created after I moved to Tucson, Arizona. After working together on a few projects together now, but how did you start talking about Scout? What’s your relationship to the Scout series? Right after we finished A Man Named Hawken, Dad started to get some inquiries from publishers about continuing the Scout series. We couldn’t find a deal for Scout: Marauder that fit, but we had become attached to the material. We really wanted to figure out how to get the book out there. I have a long relationship with the Scout series. I remember seeing Dad working on Scout while I was growing up. Dad worked at home, so I would sit on the basement steps and watch him draw. I would page through the book whenever I found a copy. Fans wrote letters to Dad about Scout and talked with him at Cons about the comic. I grew up knowing that it was important to a lot of folks. It’s also like a parallel account of my life. When I was first rereading the series in preparation for the new book, I saw in the credits of one issue that there was a guest artist because my sister Emily had just been born. In the letter columns of Scout: War Shaman, my Dad included a travel journal about a trip he took with my mom to the southwest. I remember that trip because my sister and I stayed with my grandparents in West Virginia for a whole week. I’m curious about the dynamic you two have here because you two are telling the story of the sons of a character your dad created when he was around the age you are now. Making comics is a dream job for a lot of people. I’m extremely grateful for the opportunity to create stories with dad. We work really well together, and I am very lucky that he considers me a collaborator. I am especially fortunate to have a role model that has made a living as an artist. That has helped me in my career as a game designer and writer for games. Once you started working on the story, how did it take the shape of two books like this? We only recently decided to do two books. A successful Kickstarter gets you all of your money up front. We don’t know how much postage may increase in the future, or how a trade war might affect the price of supplies and shipping. Two books will help make sure that the story is out there, quick and cost-effective. How did Kickstarter end up being the right way to go with this? We want to tell this story in our own way. Kickstarter was the best way to create the book on our own terms. I know that you live in Tucson. Talk a little the landscape and how that plays a role in the book. Every aspect of Apache culture was born out of their relationship to the desert. It is a beautiful yet brutal landscape. If you spend any time under the southwest sun, you will appreciate the strength and endurance that was necessary to flourish in this climate. So what is your elevator pitch for the book? What can people look forward to? Why is this a book people should order on Kickstarter? Scout was a hero to some, and a terrorist to others. After his death, his two young boys were separated. Tahzey, the oldest, was raised in the cities outside the desert, stripped of his traditions, a wanderer looking for a place to belong. 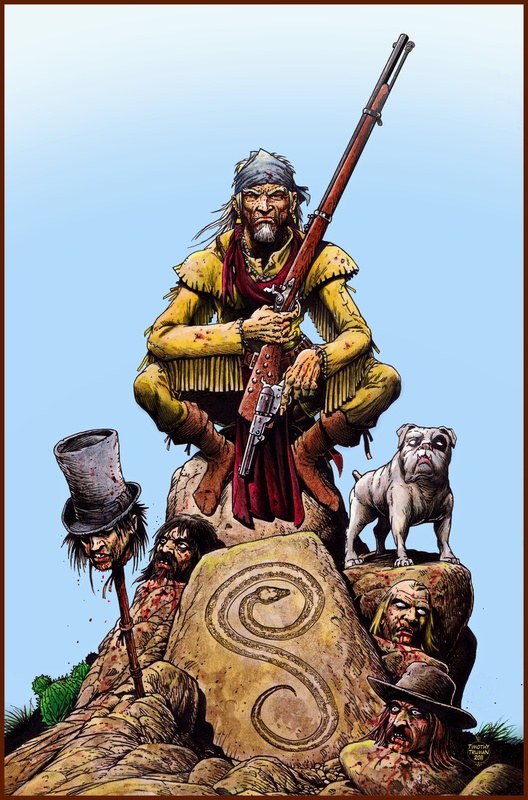 The younger brother, Victorio, grew up alone in the desert, guided by the same Apache spirits that aided his father. When the two are reunited fifteen years later, they must learn how to be brothers again. I think people will appreciate the story and art. Scout has a lot of 80’s nostalgia, and Marauder will have some 90’s nostalgia. We have a lot of cool art related rewards for supporting the book, and we are using money from the Kickstarter to also support indigenous people, like printing rewards with a tribal printing press. I hope that you’ll give the book a look. Thanks a lot!